Comodo Internet Security (CIS) is an integration of an enterprise class packet filtering firewall, a powerful antivirus, and an enhanced host intrusion prevention system known as HIPS. Together, all these offer a 360° protection against external and internal threats. The 'Secure Shopping' feature available with CIS allows online banking and shopping to be performed without fear that sensitive information like credit card passwords and numbers will be stolen or tracked. You may come across applications and websites that you feel is not safe to open. Here, the Virtual Desktop' allows you to open these in a secure environment isolated from the rest of your computer. You are guaranteed to be kept safe online because of the inbuilt URL filtering capable of blocking malware websites. Each of these components used separately will help to deliver greater protection against particular threat challenges. A complete 'prevention, detection and cure' security system is provided for your computer when all these components are employed together as a complete suite. Proactive antivirus engine capable of automatically detecting and eliminating worms, viruses, and other malware. Besides the powerful on-demand, on-access and scheduled scan capabilities, it is now possible for CIS to just drag-and-drop items onto the home screen in order to run an instant virus scan in an effortless manner. This is a rules-based intrusion prevention system responsible for monitoring the activities of all processes and applications on your computer. The activities of malicious programs are blocked by HIPS by putting a stop to actions that could damage your system-memory, operating system, personal data or registry keys. CIS has a greatly configurable packet filtering firewall that regularly defends your system from outbound and inbound Internet attacks. Authenticates all processes running on your computer and prevents unknown processes them from executing actions that could indeed cause harm to your computer. Additionally, unrecognized applications and processes will be auto-contained and run under a set of restrictions in order to prevent further any harm to your computer. As a result, untrusted (but harmless) applications are given the freedom to function and while at the same time it is ensured that untrusted (and potentially malicious) applications can not are prevented from causing cause any damage to your data or PCintegrity of system. The Virtual Desktop is a sandbox operating environment within which you will be able to browse the Internet and run programs without fear that those activities could cause damage to your real computer. The Virtual Desktop available with a virtual keyboard for thwarting key-loggers enables home users to find their virtual desktop to be perfectly ideal for sensitive tasks like online banking. Advanced users will indeed appreciate the possibility to run beta-software in an environment that will not upset the file structure or stability of their production systems. Another hi-tech layer of protection against malware is represented by the VirusScope. The VirusScope is capable of monitoring the activities of processes running on your computer and also sends alerts if they take actions that could possibly threaten your security and/or privacy. VirusScope users uses a system of behavior 'recognizers' to detect unauthorized actions and also allows you to entirely undo them. Another hi-tech layer of protection against malware is represented by the VirusScope, besides offering you with the granular power to reverse unnecessary actions performed by legitimate software without completely blocking the software. This is an inbuilt wizard allowing you to burn a boot-disk capable of running antivirus scans in a pre-Windows/pre-boot environment. A security hardened virtual environment offering total protection for online shopping and banking. Independent SSL certificate verification, process isolation, screenshot blocking, remote takeover protection and memory-scraping prevention are the available features. This helps in protecting you from phishing and malicious sites while surfing the net and also allows you to develop rules for preventing the access of certain websites by specific users. CIS uses real time cloud based look up rather pre-defined local list of websites. This ensures that any new threat is detected immediately as soon as it is in Comodo block list on server side rather waiting on updates to be available locally. New phishing and malicious sites come up every second and this cloud model ensures user gets up to date protection without bothering about updates. ships with a number of preset lists of malicious websites which develop an efficient website screening and protection feature for all Internet users. Additionally, you can also will be able to easily add or import your own lists of banned URLs and then set up custom access rules for each user on your computer. The improved tasks section is available with links that permit you to install other, free, Comodo security products - including KillSwitch and Comodo Cleaning Essentials. TrustConnect permits surfing the web safe from any public Wi-Fi location. You will be able to back-up your important data to the highly secure servers offered by Comodo. Data is encrypted and can thus be accessed only by the user from any Internet-connected computer available anywhere in the world. If your computer is damaged due to malware and if it is not possible for Comodo support services to bring it back to a working condition then the company will pay the repairing costs. Complete details are provided by the End User License Agreement. CIS is available with an extremely strong web-filtering module capable of protecting against phishing and malicious websites across all leading browsers. CIS can be used as it protects against malware by guaranteeing that only legitimate and safe applications run in a user’s PC and thus no zero-day malware will be able to compromise the user’s PC. Any Standard antivirus will first have to know the threat in order to detect the threat. Malware authors capitalize on this threat detection model, and after developing malware, they then carry out scanning and testing, in a closed environment, against these standard detection based antivirus products. After obtaining the application not detected by other AVs, they get released in the wild. By the time the AVs obtain the file, analyze and then add detection of those files, malware author has already attained objective and commenced working on another zero-day malware. Here is where Comodo plays a crucial role. It is just not possible to compromise a PC running Comodo since it permits only known safe applications to execute changes in the system with everything else running in Comodo container, where malware assumes that it is making changes but because of virtualization of COM interfaces, Registry, Disk, and Memory, it is indeed fooled and thus not possible to make persistent changes. This is the point where Comodo beats the competition, malware author will be able to by-pass other AVs, but fails to by-pass Comodo as it only permits trusted application. Hence, if a user desires to be protected against all zero-day threats, there is, in fact, no substitute of Comodo. The client is the end user in CIS. Any typical end user will desire to browse the internet and then install the software without any compromises. However, this is not possible with a conventional antivirus as it will have to know the threat in advance. Comodo provides the best security software that allows anyone in a family to use a PC without having to fear that the PC could become infected as it is available with a default-deny approach. According to this approach, if an application is not a trusted one then it will automatically run in the Comodo container. Users can now browse the Internet and execute applications without a fear factor. CIS is thus an established license to online freedom. 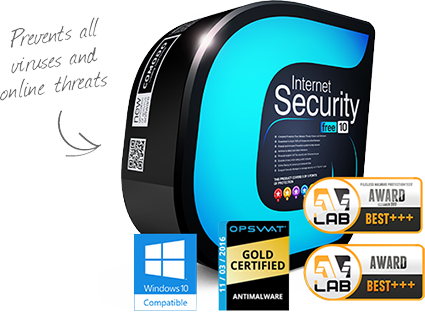 CIS is the only anti-malware solution that keeps PC in known state by permitting only safe applications to run. Unknown applications are run in container and cannot harm PC. Only software, which upon finding an unknown application, runs in container, thus providing protection against zero-day malware. Only antivirus security software that is capable of classifying an application running in a machine under: Trusted, unknown and malicious categories and guarantees that files are either classified malicious or trusted so that there are no unknown entries. This guarantees that the PC is in a known state.